We all love a bit of Advance Wars: on the sofa, on the bus and probably even on the loo. But on the table, with cards and counters instead of buttons and bleeps? 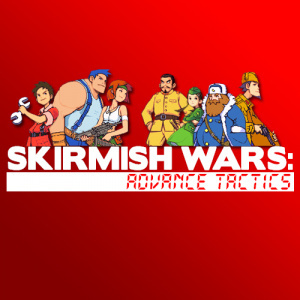 Well, that's the ingenious idea of several enterprising chaps who've devised Skirmish Wars: Advance Tactics, transporting the turns-based war game into a turns-based war board game, complete with buildings, CO powers and plenty of cutesy little units. Although naturally some liberties have been taken to keep the game flowing, it certainly looks remarkably close to the handheld titles and we at Nintendo Life would certainly love to get our hands on it. If you're keen to try a new spin on the title – including the new ability to knock all the units off the table if you lose – you can download the whole set from Board Game Geek. 'New levels of boardom.' Oh very clever. Ace. This game is now destined to make chess obsolete. I think I'd rather have a new entry on the DS with the old style than a board game. I love the print and play section over there (which this is part of). For those unfamiliar with it, basically all you need usually is a printer, paper, some way to cut stuff and dice (sometimes some counters and those glass beads they sell for 1.00 at craft stores work great). The best part about them? They are free. There are some really good game designers over there that put out some really good games. I remember the makers of this one talking about it last year and I'm glad they finally got it out. It's about time someone does this. I'd like to see this done with more turn-based video games. Color me intrigued. I must know more. That's awesome. One of the sad side-effects of video games is that people have forgotten how awesome a simple board game can be to play. it wont be fun as the card game munchkins!! !